The Autumn Bridal Spectacular Show is just around the corner where wedding industry professionals will have the opportunity to meet with more quality brides than at any other bridal show in Las Vegas. To make sure you get the most out of the show, we have a few tips on how to bring your A-Game and turn those leads into business! Having a great looking booth that includes all the essential booth signage and handouts is incredibly important to help you look professional and standout from the crowd. Be sure to order any booth materials needed in advance, such as banners, business cards, brochures/handouts, signage, and branding. Include your booth number on all your pre-show communications, including emails, direct mail, ads, social media and your website. Send out a pre-show email blast asking brides to stop by to see you. You can also email personal invites with targeted messages or any promotions you will be offering during the show. Post announcements on your Facebook, twitter, Instagram and other social media channels asking your followers to visit you at the show. You can also run a social media contest or provide an exclusive social media offer for those who stop by. 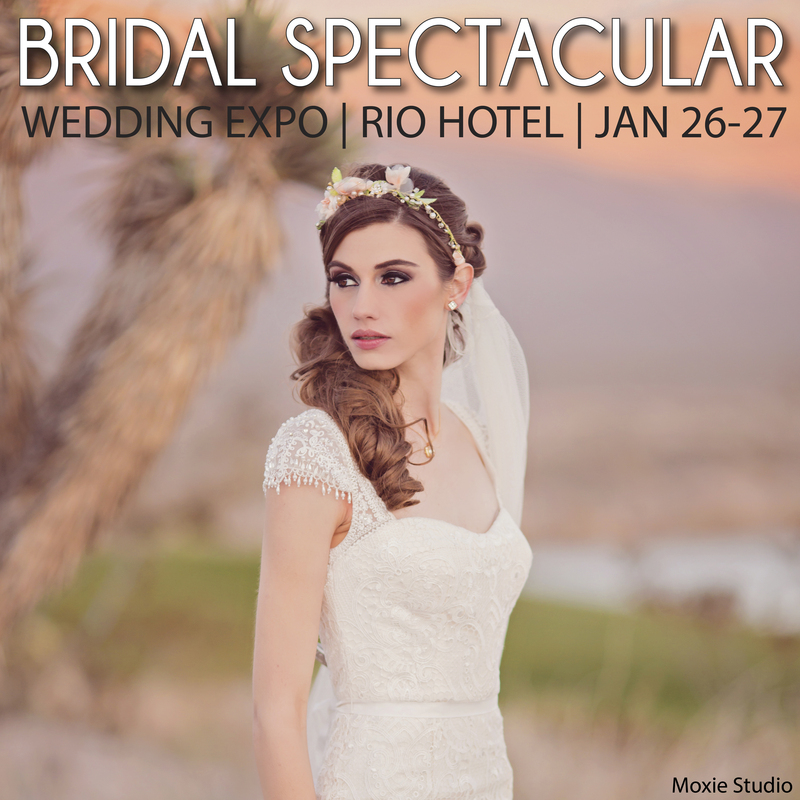 Offer brides a special gift or discount if they come visit your booth. Send half of something of value to attendees before the show, and promise to give them the other half when they visit your booth. Post the Bridal Spectacular show schedule on your website and social media sites with a link to sign-up for a special one-on-one consultation. Have enough staffers on-hand so you are able to speak to as many brides as possible. Bring booth staffers who truly want to be there — nothing is worse than an unenthusiastic person who doesn’t appear approachable. Give your staffers regular breaks so they don’t burn out. Don’t hide in your booth or behind the tables! 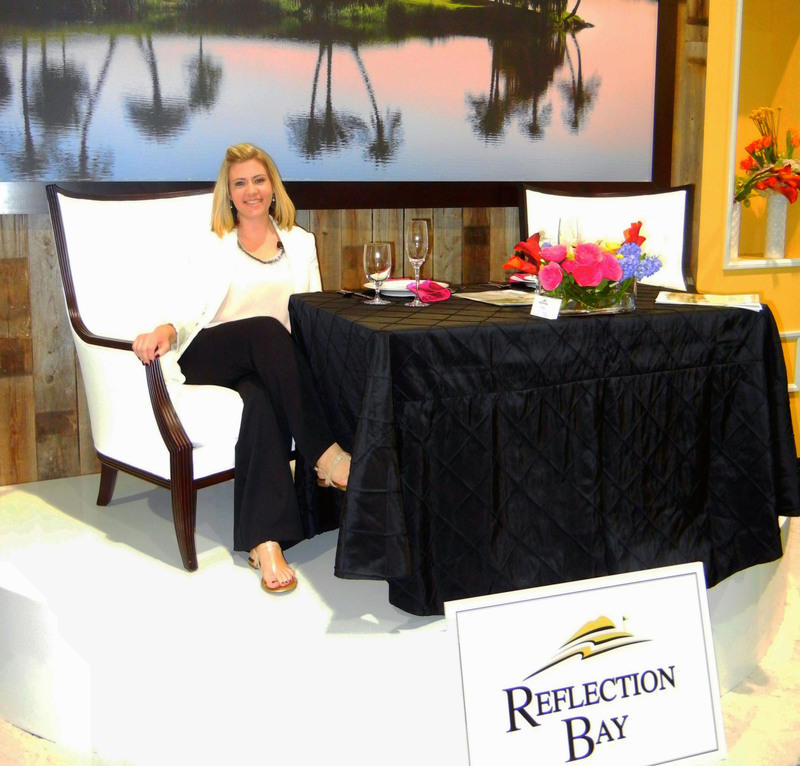 Stand (not sit) near the aisle to gain more foot traffic and appear more approachable. Consider holding a contest to reward the staffers who bring the most qualified leads. 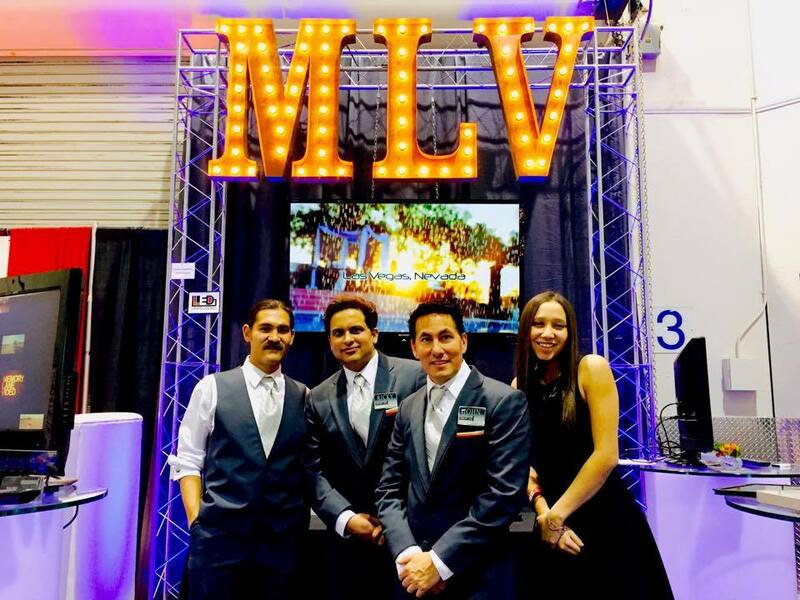 Bring your top management or owner to the booth and let the brides know they will be there to meet and answer all of their questions face-to-face. 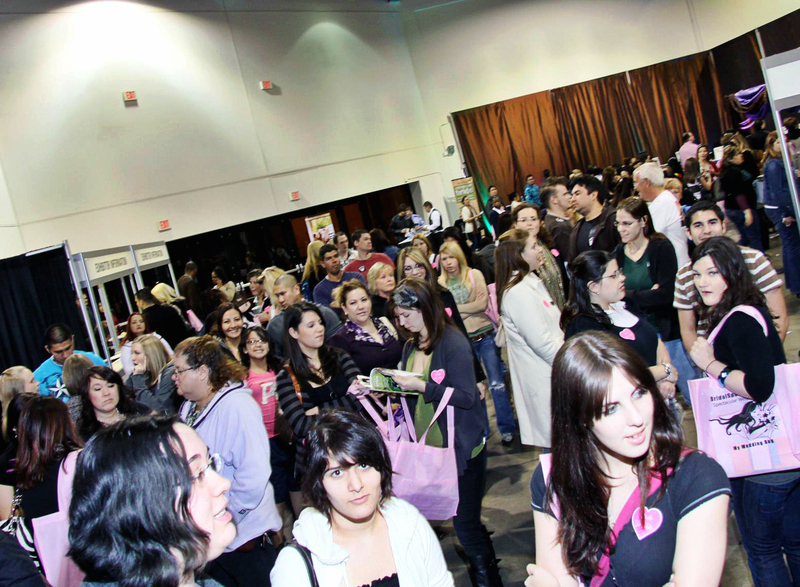 Make friends with other vendors at the show so you can refer attendees back and forth. In addition to giving away literature, also be sure to get the brides contact information so you can follow-up and send additional information afterward. Consider doing a raffle, offer a prize, or special show discount to reward brides for visiting you. This will also help draw more attention to your booth! Give your attendees something entertaining and fun to do, like an engaging demo. Run presentations or video loops on large video monitors and play music to liven up your booth. Put out a candy dish to slow down attendees long enough to engage them. After the show is over, you still have work to do. It’s imperative to maintain the momentum you’ve built during the show and contact your leads while you are still fresh in their mind. Whether it’s an email or phone call, following-up promptly is a great way to help your company stand out from competitors that may take weeks to follow-up. Being proactive, bringing your A-Team and implementing just a few of these marketing tips is sure to lead to a more successful show, and more importantly, more business. Good luck and we look forward to seeing you all soon! 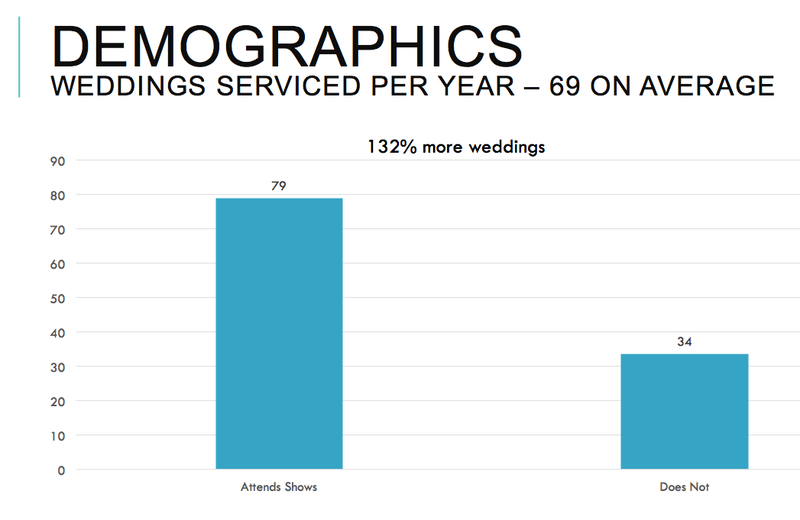 The 2015 BSPI National Survey Results are in — Bridal Shows are Paying Off! The Bridal Spectacular Team recently had the opportunity to attend the 2015 Bridal Show Producers International Conference (BSPI) where they shared fascinating stats and information about vendor’s experiences with bridal shows. BSPI used The Wedding Report to survey 951 wedding industry companies just like yours, examining both vendors that do and do not participate in shows. The survey was comprised of a wide-range of businesses, including photography, venues, hair and make up, florists, DJs and many more as noted in the chart below. Out of the 951 vendors surveyed, the businesses that consistently participated in bridal shows increased their revenue by 10 to 50% — the national average saw an increase of 35%. 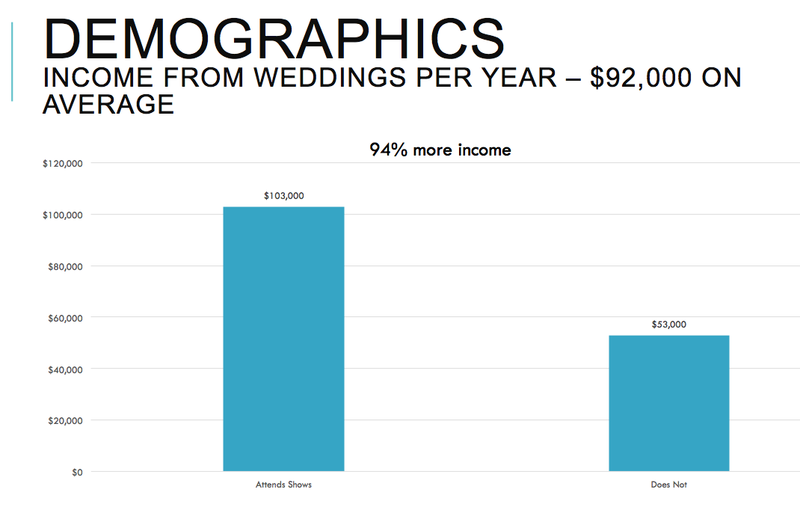 In addition, companies that attended bridal shows also produced 132% more weddings and generated 94% more income than companies that did not exhibit. Another interesting fact, statistics show that about 34% of couples planning weddings do attend bridal shows during their planning process. Some vendors even reported that as high as 50% of their business comes from exhibiting in bridal shows, while the smallest percentage still reported they received at least 10% of their business from leads they met a show. So, if your company is not exhibiting, that is up to 50% of potential business that will be going to your competitors instead of you. What does this mean for ROI? 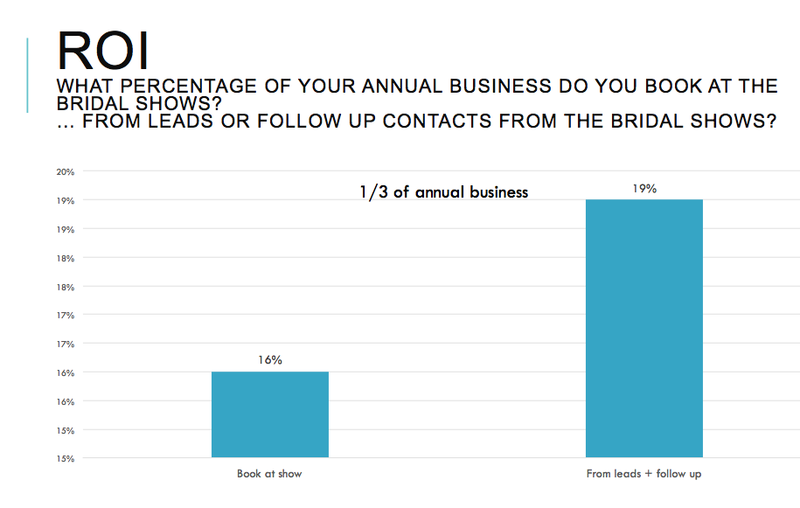 Of those surveyed, companies reported that 1/3 of their annual business comes from leads they met directly at a bridal show. To top it off, the vendors who were proactive and had a great post-show follow-up plan saw 19% of their annual business come from following up with the leads they met at a show. Does your company have a strategic pre and post-show plan in place? The companies that were surveyed certainly do! 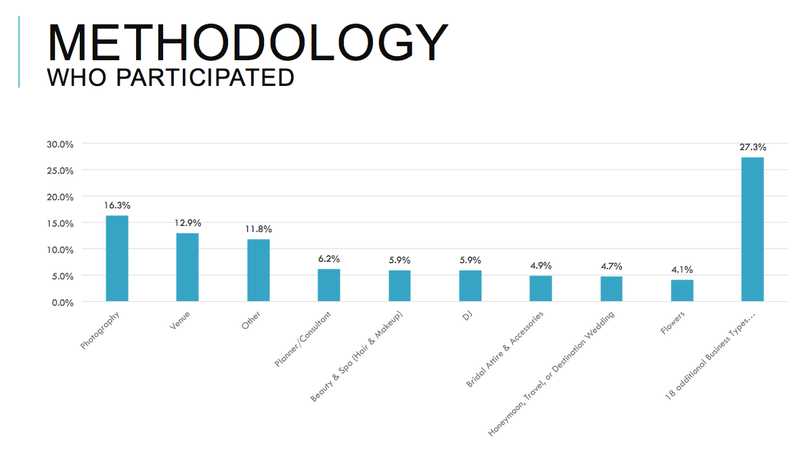 In addition to attending bridal shows, the below graph shows what these businesses are also doing to supplement their lead generation efforts. When evaluating all of this insightful data, it validates that exhibiting at bridal shows not only helps vendors achieve more brand awareness and gain more qualified leads, but also the amount of business and revenue generated from these leads provides a considerable ROI. When companies coupled a comprehensive marketing plan with consistently exhibiting at bridal shows, the results spoke for themselves. Not only are these companies generating more leads and revenue, but they also giving their competition a run for their money! As Las Vegas’ longest running regional wedding Bridal Show, Bridal Spectacular can help you reach qualified brides at prices every business can afford. Please visit BridalSpectacular.com for details and more information. 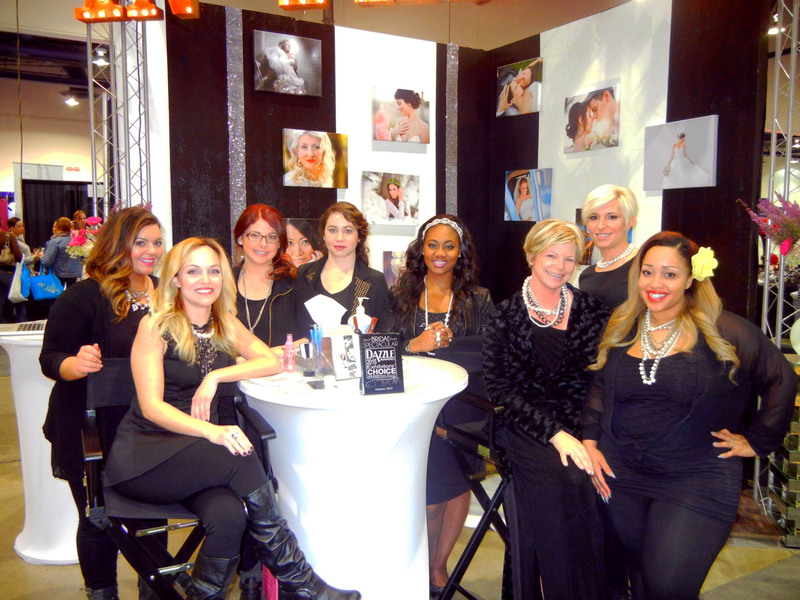 Wedding Industry Professionals Share Their Tips & Secrets for a Successful Bridal Show! With one of our most successful bridal shows to date in the books, it’s time to begin planning our autumn show! So we ask ourselves, how can we enhance the next show? What did we miss? How can we better reach wedding planning couples? These are things that not only we at Bridal Spectacular always consider, but also vendors should regularly think of to help improve the bridal show experience for your own company. 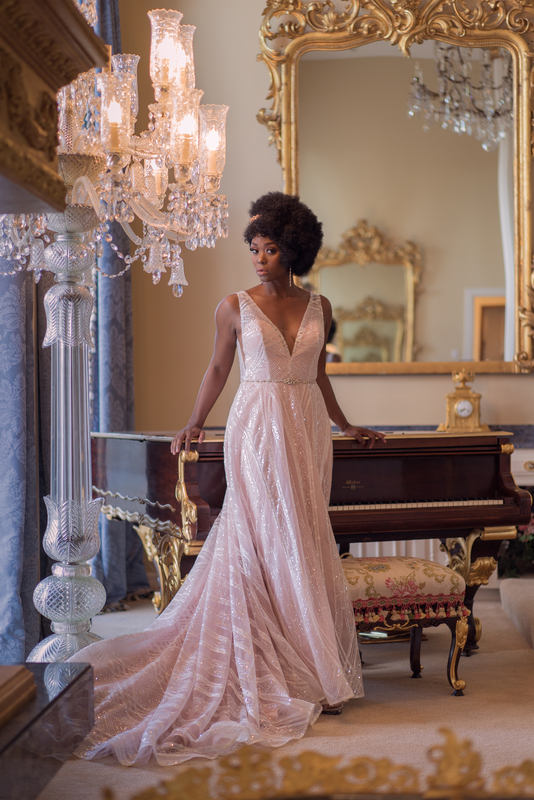 So, to help all the Las Vegas wedding professionals with ideas and tips, we spoke with a few of Bridal Spectacular’s seasoned vendors to learn about their experience and what their secrets are for a successful bridal show! John Sanchez and Ricky Gulati from Memory Lane Video participate in both the winter and autumn Bridal Spectacular shows. They said exhibiting at a show has been beneficial because it allows them to better connect with couples and build relationships, “I like to observe physical cues to help me better read what a couple is looking for and make a personal connection with them,” said Ricky. 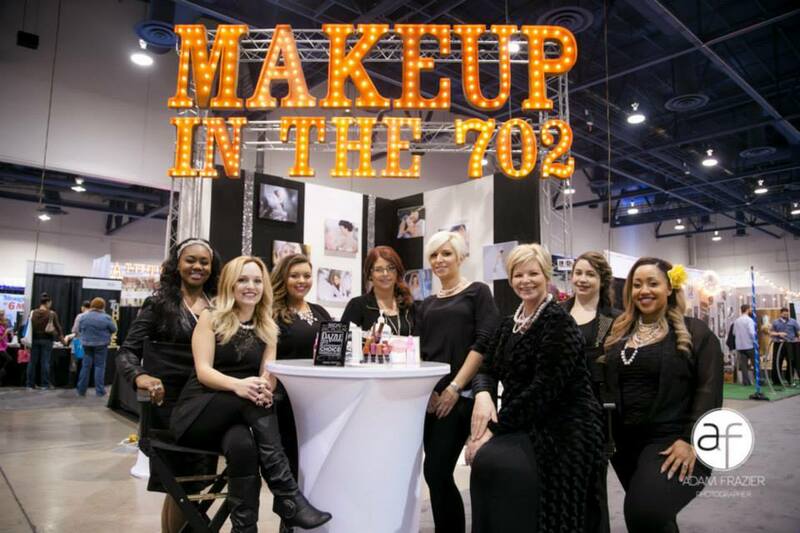 Megan, Owner of Makeup in the 702 participates in all Bridal Spectacular bridal shows. She said taking full advantage of all the promotional opportunities has really helped them gain more exposure and it’s very important to the livelihood of her business, “We take advantage of every opportunity Bridal Spectacular offers, from advertising in Spectacular Bride magazine to participating in the fashion show,” Megan said. “Having a booth and also doing the fashion show has been the best thing for us because it regenerates my girls and solidifies everything we love about working with brides.” She also mentioned that each vendor has their own special secret for a successful bridal show, but one of her favorite things about exhibiting is being able to meet so many brides face-to-face and build great partnerships with the other vendors. 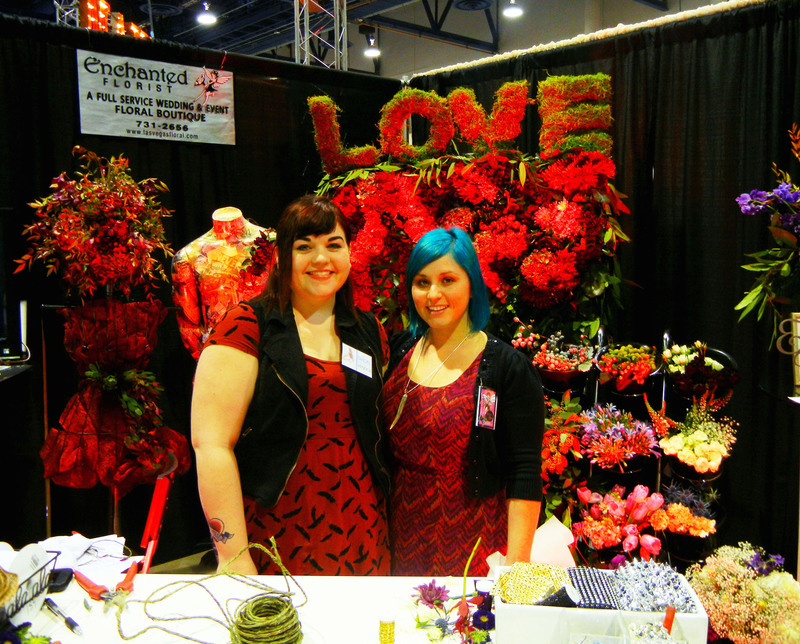 Michelle from Enchanted Florist said the winter show is their favorite and always the busiest for them, “A lot of engagements happen during the holidays and brides are more excited and prepared to speak with us in January.” They also do the August show to continue the reach to Las Vegas couples. Michelle added that she prefers to speak to couples in person because they book with the people, “Being able to talk to a couple face-to-face is always better because you are able read them and provide better ideas than you could do over the phone or in a email.” Michelle’s biggest tips for a successful show is to include signage and get good people to staff your booth, as the couples will end up booking off of personality more than anything else. She also mentioned that they implemented an interactive display at this past show, which was tremendously successful for them! 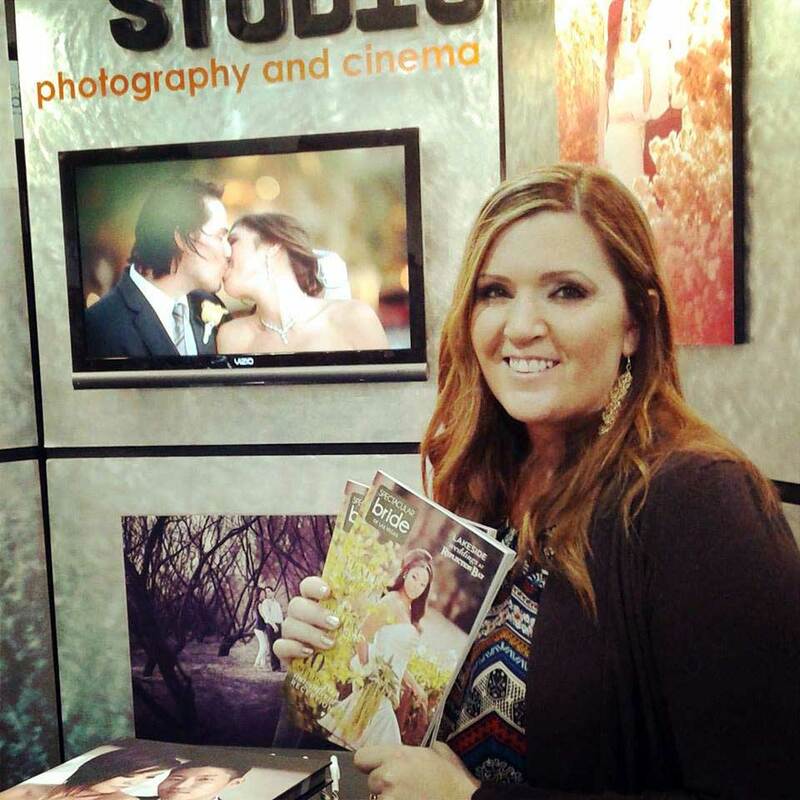 Lisa, Owner of Moxie Studio Photography, participates in both the winter and autumn bridal shows and is also an advertiser on the Bridal Spectacular website and Spectacular Bride Magazine. She said her favorite part of participating in the shows is being able to speak with couples face-to-face, as she gets better results in person. Her biggest tip for a successful show (especially for vendors that are exhibiting for the first time) is to “make a wow” and leave a really great first impression! Thank you to all the amazing wedding professionals for sharing your great tips and personal experience with us and with your fellow vendors!